Carolina Arms Group is located not very far away from me at all. About 45 minutes up I-77 and I’m pulling into their parking lot. So I’ve come to know the owner and I’ve met most everyone working at CAG. CAG has made some very nice 1911’s… and some of the the best 1911’s I’ve ever handled. That was the Trenton Series, a family of 1911’s named after the Battle of Trenton. But now CAG has a new series of pistols. Meet the PRIVATEER. 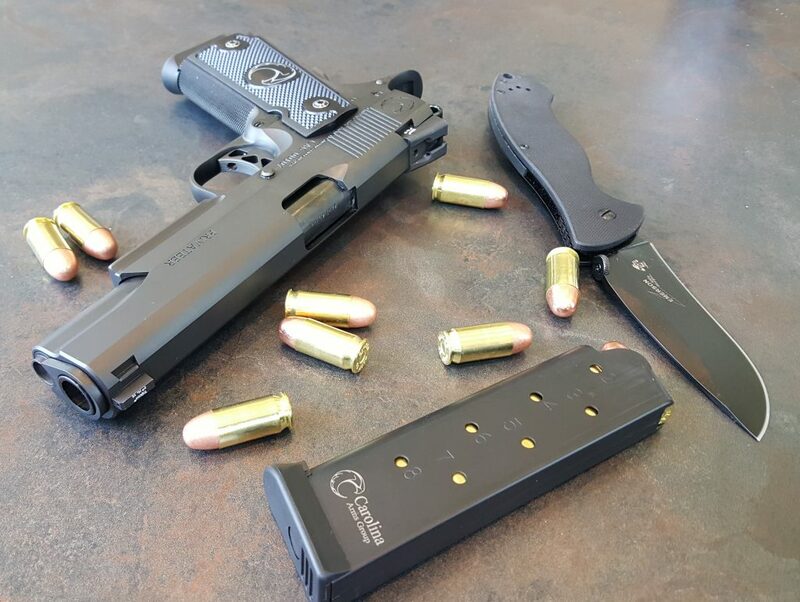 THIS IS THE BEST 1911 I HAVE EVER SEEN. I’ve been into 1911’s since I was 16 and the father of a girlfriend introduced me to them. His name was Dave and he was awesome. I don’t even remember his daughter anymore… but I remember Dave. Dave taught me the Tao of Browning. He taught me how the gun works, inside and out, and how to shoot it. Dave literally saved my life because of this… because the Army gave me Zero training when they issued me a 1911 and it was a 1911 that I used to save my life when someone was intent on ending it. I’ve always loved the 1911 since those rather exciting days. And I’ve always taken them seriously because of it. 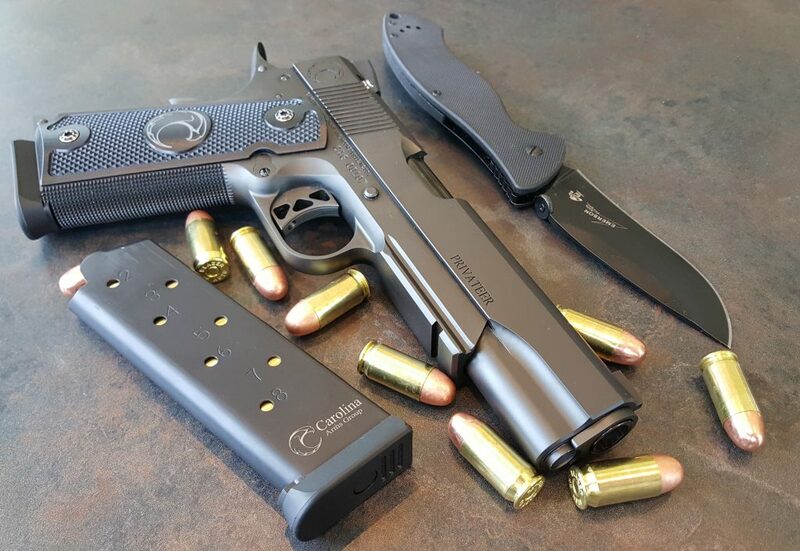 I’ve tested and reviewed some of the best 1911’s on the planet, and have owned 1911’s from the likes of Terry Tussy and other high end custom gunsmiths… And let me tell you… The CAG PRIVATEER 1911 is the finest example of the 1911 Pistol. Period. Saint John Moses Browning himself smiles upon the CAG Privateer and is well pleased. Differences from the Trenton series have the Privateer using a regular, fine, checkering on the frame and the inclusion of an accessory rail. Up top it’s wearing Tritium Night Sights instead of fiber optics. As all serious use handguns should. The grips are a slim profile, which makes the gun more narrower in the hand, which is great when wearing gloves… and even better when the gun is tight against your side when it’s riding in a holster. The whole gun, including the barrel, is finished with a gorgeous DLC finish. Diamond Like Coating. The DLC Finish is incredibly strong, resistant, and smooth. The gun looks amazing. The laser engraving really pops and looks clean unlike anything coated in Cerakote or other finishes. The Fit and Finish are – FLAWLESS – to the point that no photo will ever do these guns justice. You have to see these guns in person. You have to feel them in your hands. You have to feel the slide’s action. You have to feel the trigger. 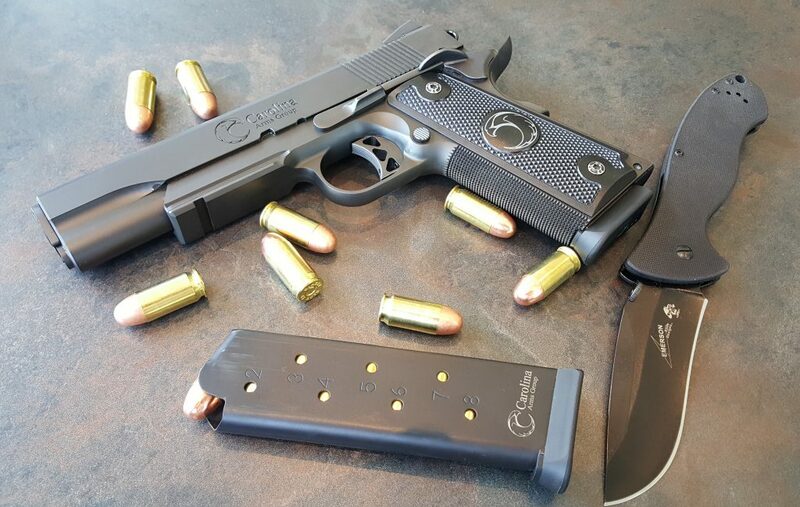 You have to feel the difference between these guns and every other 1911 out there. One day, I’m going to own a CAG Privateer in a Commander length. Hit Carolina Arms Group on Facebook, and tell them I sent you. 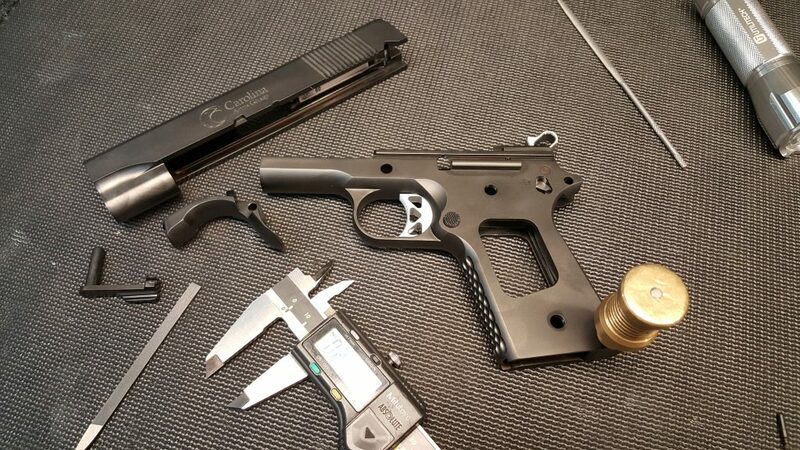 If you want a Carolina Arms Group pistol… See them at Point Blank Range. Or contact PBR and order one. 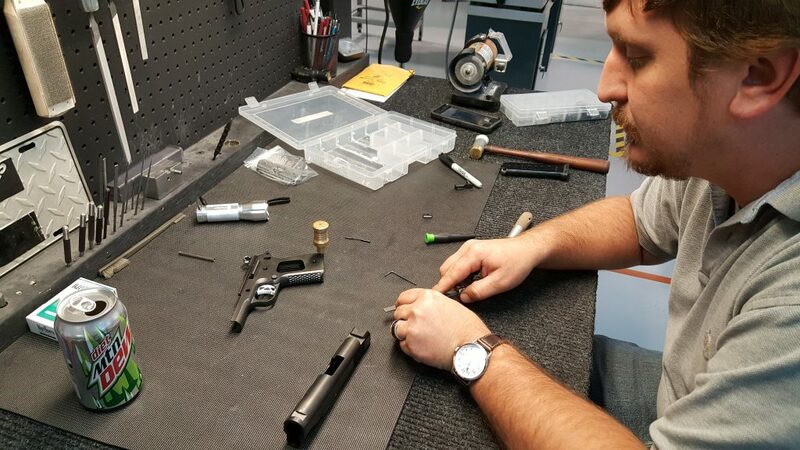 I paid a visit to Carolina Arms Group today… The makers of very desirable things. 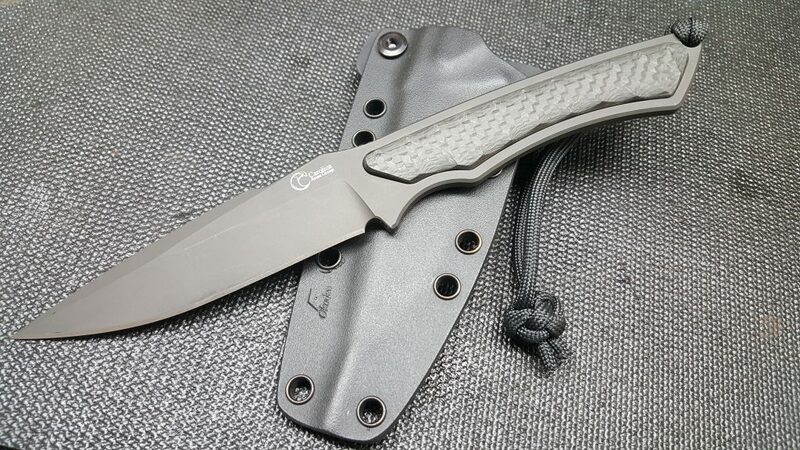 I got a peek at a new model, the Veteran Carry… which is an insanely smooth Bobtail Commander. It’s fantastic. Save your Pennies. And they are going to be rolling out some knives with carbon fiber scales, and matching carbon fiber grips for the pistol. VERY nice. Impressive. Mark threw some laser engraving on my knife… Thanks, Mark! If you guys need anything lasered – contact CAG and talk to them about it. Their laser system is fast and precise… sharpest looking laser work out there. The new Veteran Carry – that’s the one to get! Sneak Peek at the new Veteran Carry pistol. It’s not even finished and it’s gorgeous as hell. The Want is strong with this one. Taking the time to fit it right. By hand. The little details are the important ones. It has to be perfect. What goes good with a high quality gun? A high quality blade. 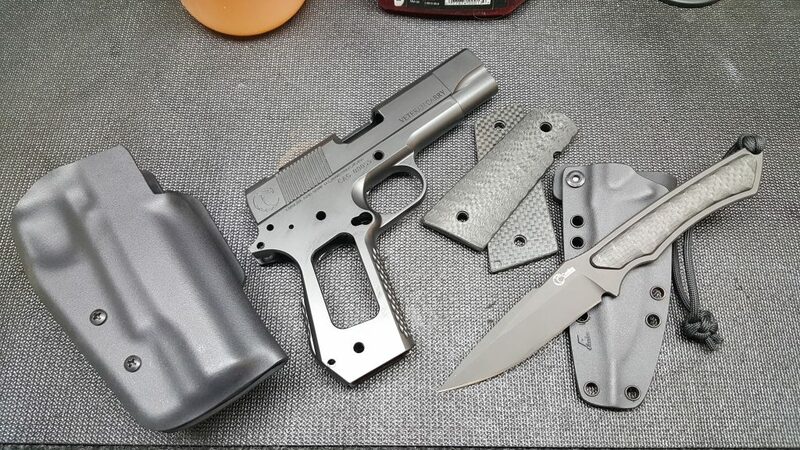 You’ll be able to order a Carolina Arms Group accessory kit with your pistol… Which includes the holster, knife, and matching grips. That is a beautiful gun. Oh well. Oh my…you didn’t mention a price. I will assume this is for the best because there is no way I can afford that anytime soon. I will ask…are those magazines any good? The price – You could buy a great used motorcycle for the price. The Magazines are just as good as any others I’ve used. I like the coatings on them… They feel very slick. Nice. I read reviews on the Firearm Blog and TTAG. 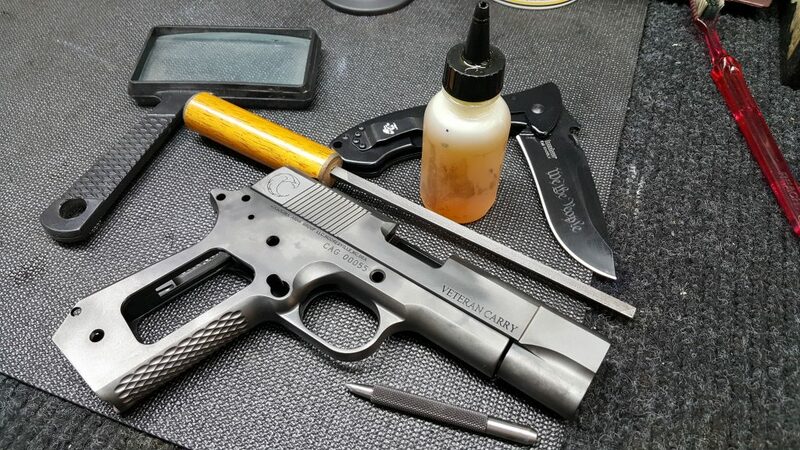 Would you say that this 1911 is in the same class as Wilson or Ed Brown or Les Baer? What’s the best way to order one? I live in the West Palm Beach area, and would have it shipped to Shoot Straight WPB. I will be in the Charlotte/Newton area in September for my wife’s Granna’s 101st birthday. How far is that from Point Blank? Could I purchase it there and have it shipped? Matthews, where one of our PBR locations is… It’s just outside of Charlotte, within the 485 Beltway. Thanks. It will be mid-September. My wife said she used to go to a dinner theater in Mathews; knows exactly where it is. Side trip no problem. Hopefully, they will have a Privateer in stock. We HAD a Privateer today… But I am sure we can get another one very quickly. In fact… I’m sure of it. I will call the store when we select a flight date. I’ll know our itinerary by then. Granna’s party will be at the Abernethy Laurel assisted living facility in Newton; probably Sept. 10th. We will be staying there. I’d like an extra mag (3 total) and a recommendation for a holster and spare mag holder. btw, I really like the Kassarine series. Give me the heads up on when… and not only can I make sure there is a Privateer there, I can arrange it if time allows, for a Custom Serial Number as well. Will be in Mathews on Monday, 12 September. I have tried to contact PBR twice through their link with no response. If possible, I’d like to see and likely purchase a Privateer or the new Veteran Carry you wrote about briefly. It would have to be shipped to my FFL in West Palm Beach, however. Is that a problem? I am no longer with PBR. But CAG can indeed ship to your dealer in FL, that’s not a problem. I can get you in touch though with Mark McCoy, CAG’s CEO, and he can have your gun personalized. 4K? You have to be kidding…. I do not kid about Food and Firearms. When will they get this on their web site? Weird. I have been shopping 1911s and had settled (fluidly) on a C&S Trident II.